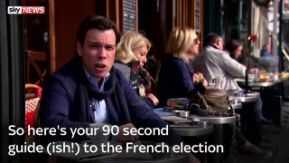 Polling stations have now opened across France for millions to cast their votes in the most unpredictable presidential election in decades and one which will be a test of voters' anger with the political establishment. Amid tight security people will make their choices after a campaign which pitted the far-right against the far-left with the traditional centre parties of France struggling to make ground. Four candidates are currently in a position to bag one of the two first-round places which would take them into a final run-off. With a third of voters still undecided in the final days of campaigning, any one of them could make it through. The economy and jobs have been the dominant issues of the election but security was thrust to the fore after an armed gunman brought chaos to the Champs-Elysees in the French capital on Thursday - the night before the final day of campaigning. While candidates cancelled major rallies and events, some spoke out on security and terrorism, leading to criticism they were exploiting tragic events for political purposes. Security has been intensified to ensure the election goes ahead without any problems. Some 50,000 police and 7,000 soldiers will be deployed across France to protect voters. Authorities in Paris have offered additional guards for any polling station that needs extra support. Close to 47 million people are eligible to vote in the election, with 1.3 million of them living abroad. French overseas territories and French residents living in the US and Canada began voting on Saturday. The result will be as keenly watched around the world as in France to see whether the populist tide which delivered Brexit to the UK and Donald Trump to America is still at play. The two candidates who get the most votes in the first round will advance to the second round in two weeks when a new French president will be chosen. But surveys suggest many voters won't vote at all with abstention rates predicted to hit a record high - a sign in part of people's disillusionment with politics. Some 57,000 polling stations will be open across the country with exit polls expected soon after the final ones close at 8pm (local time).